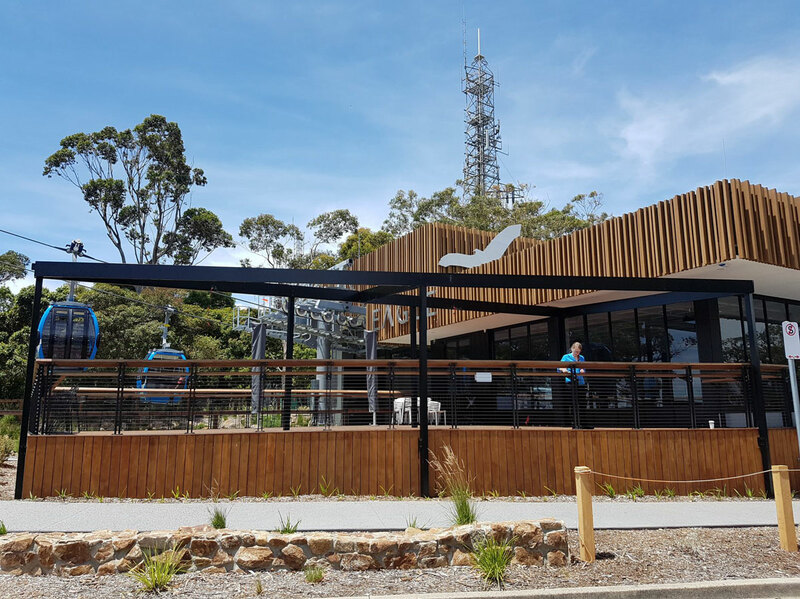 Arthurs Seat is a major tourist destination located along the Mornington Peninsula known for its exclusivity, natural bushland and sweeping views with the mountain ascending to 314 meters above sea level rewarding onlookers with panoramic views of the entire Mornington and Bellarine peninsulas. 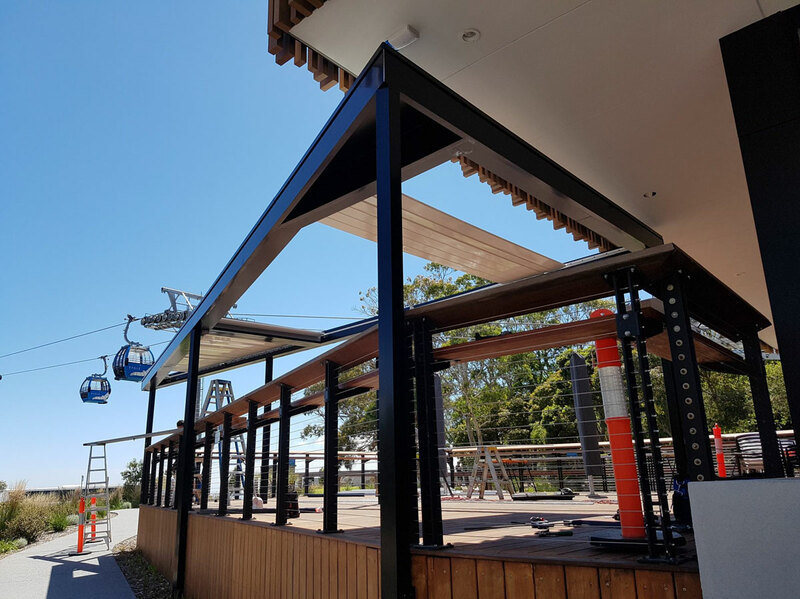 When The Eagle Gondola approached us with the expectations to achieve an effective, practical and patron friendly shade solution to be specifically designed and fabricated to aesthetically integrate their outdoor deck at the top of the mountain whilst providing sufficient weather protection we knew we had our work cut out for us. 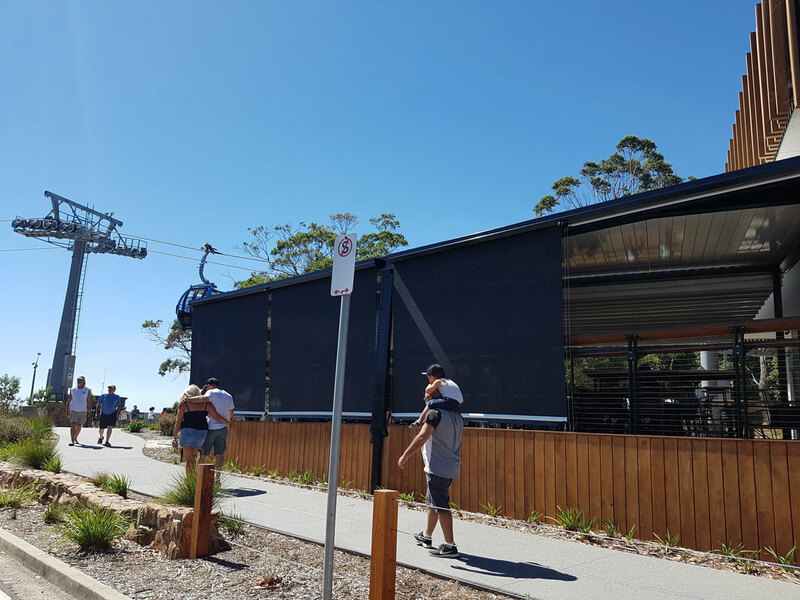 They required a space that could be used by the Gondola patrons in all conditions, blocking the summer heat in the warmer months and protection from wind and rain in the colder ones. They were also keen to be able to rent the space out for out of Gondola use hours. Being a tricky shape meant this was going to take some considerable planning, innovative design and precision building. 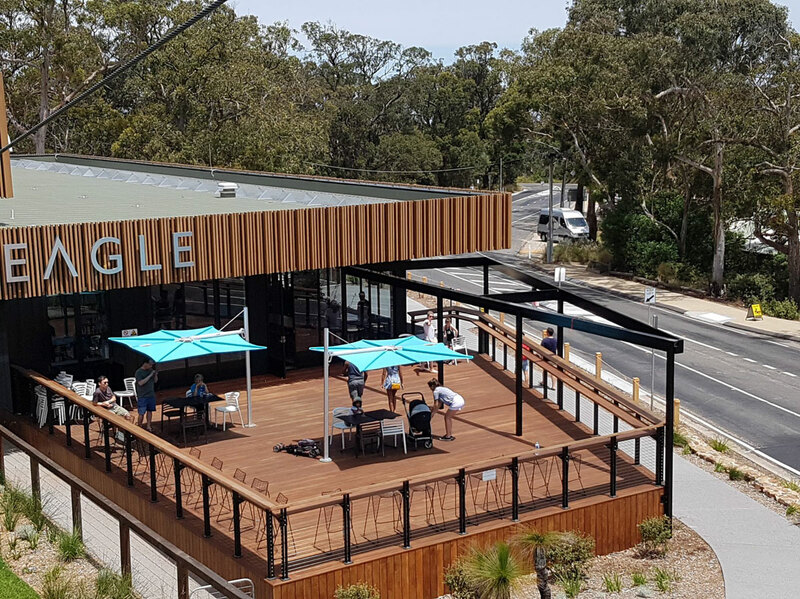 We worked closely with The Eagle Management and after 15-20 design concepts drafted we came to the ultimate customised shade solution. As the top station was only built recently the design had to fit in with the Architects design intent fitting in with the existing build. We needed a bioclimatic shade system which ticked all the boxes. The large North facing logo and signage along with its elegant facade had to remain seen when the gondola lifts approach the station so building up in front of that was never an option. This meant the awning pergola / retractable roofing system had to be lower which was quite the task in that retractable roofs typically require a minimum of 7 degree fall for water runoff. 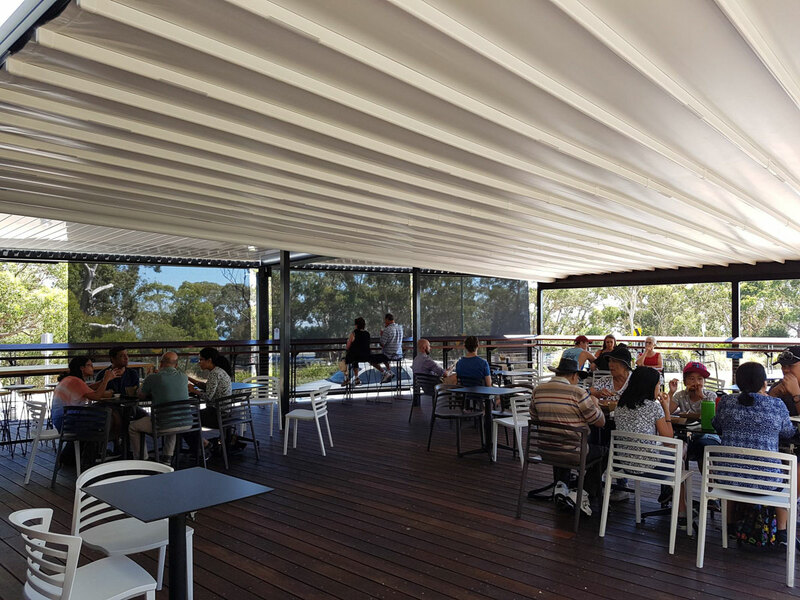 A typical awning was not adequate due to the high wind zoned area so we settled on a 117km per hr wind rated customised retractable roof system to the majority of the deck (12.5m wide x 10m projection) and a customised operable Louvre Pergola structure to the remaining triangular decking area. Due to the odd shaped decking area we basically created a rectangular area zones for the retractable roof and a triangular shape area for the Louvre Roof. Our louvre roofs have the capacity to be cut at different lengths so each blade in the two Louvre bays had to be cut specifically. The Louvre Roof Frame had to be built first and foremost as the Retractable Roof Structure utilised the main beam to frame up too. The Louvre frame had to be built precisely to ensure the prefabricated Retractable Roof fit into its correct positioning, all columns connecting into the existing timber bearer below with two stiffener connections into the steel frame of the bulkhead as per the engineering documentation. We split the Louvre Roofs into two separate bays to lessened the motor strain by decreasing the square meter area of each bay. 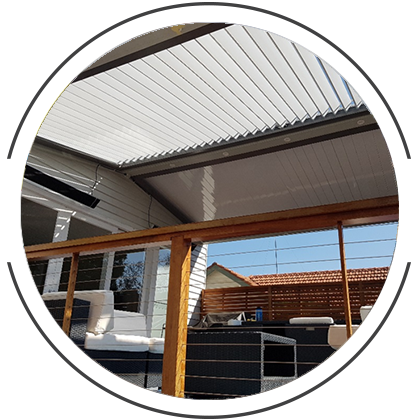 The Eclipse Louvre Roof system installed is the perfect Louvre system for any alfresco area as it gives you the flexibility to cut each louvre at different lengths enabling odd shaped bay areas. We had no other choice with this job in particular because practically all motorised shade awnings required a square or rectangular space. Having louvres to the West side of the deck meant more flexibility for the Eagle and its patrons. It gave the space some extra flare with the beautiful architectural blades with bioclimatic compatibility in all weather conditions. 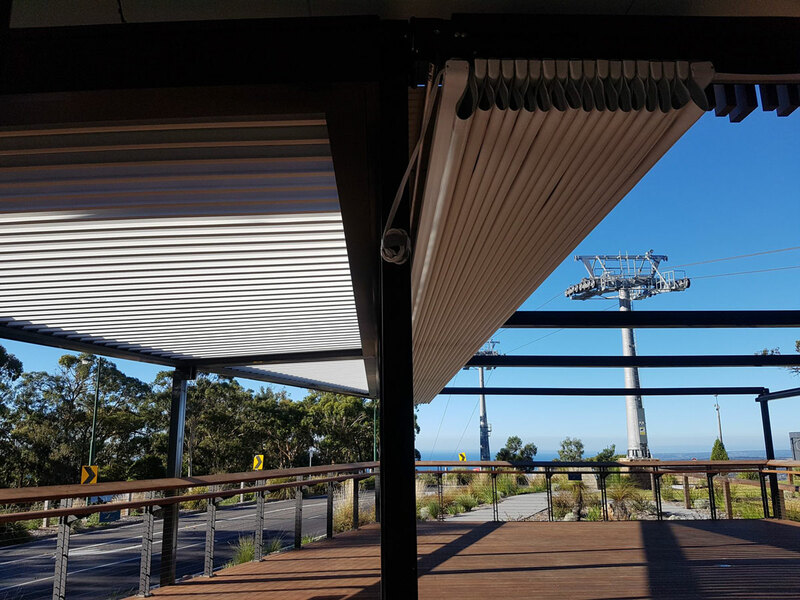 Being at the top of a mountain peak meant operable louvres were the right solution due to the excellent wind rating capacity. We aligned the louvres to the retractable roofs wind sensor which also aligned with the Gondola’s wind threshold cut off. This meant that the retractable roof and louvres would both open up at 70 km p/h allow wins to pass through meaning less strain on each shade system therefore increased longevity. 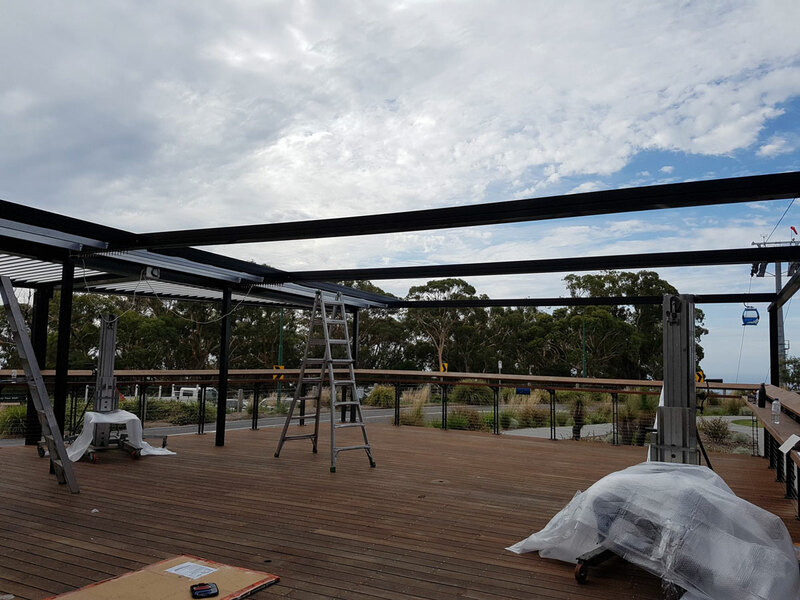 Wind, sun and rain sensors were all fitted to each of these retractable pergola systems. The Retractable Roof Structure was designed on a 3% lean to the North side of the deck to allow us to sit it under the existing bulkhead structure to the South. 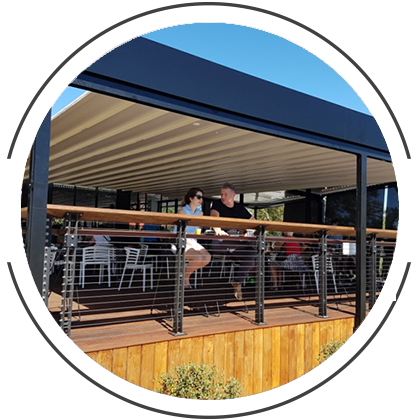 Retractable Roof Pergolas are a brilliant system for any outdoor Alfresco Area and can be customised to most outdoor applications when a typical Folding Arm Awning does not suit. After building the Louvre Frame running North-South we used this beam to create the backing for the retractable roof system with Becker controlled motorisation. 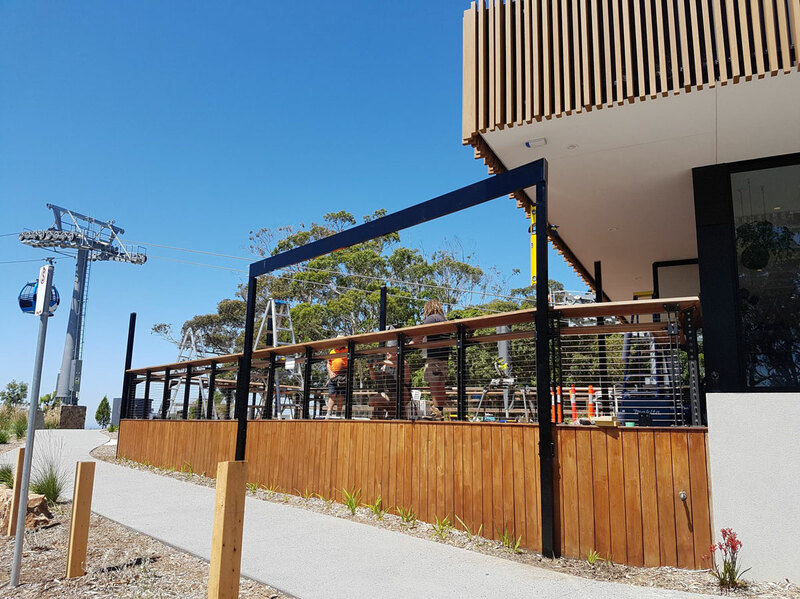 As per our engineering documentation we had to connect back into the existing bulkhead in two locations to ensure the stability of both retractable shade structures. Each of the uprights were bolted back into the bearers of the existing timber deck so plenty of work went into getting this all installed to the millimetre. Piece by piece the retractable roof is connected together and the the build begins to take shape. The Ferrari 602 full blockout PVC skin was retrofitted with runner LED lighting to give The Eagle the ultimate flexibility to use the space during the evening transforming the area into multifunctional alfresco area with the ability to use it at any time of the day or any month of the year. The PVC canopy itself weighed around 400kg and being such an awkward shape it was quite the task for our team to get this installed. It was a credit to the team and also Complete Shade solutions whom did assist in the installations works. 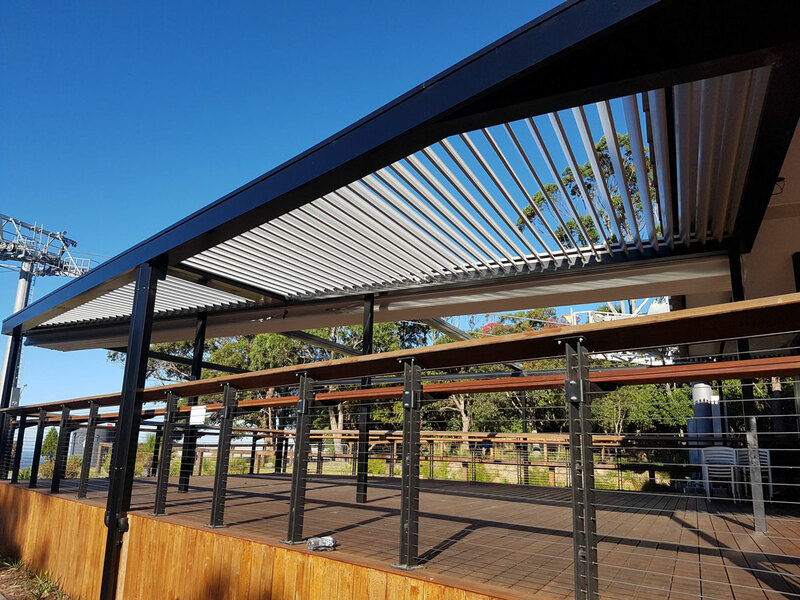 Drainage for this 104sqm retractable pergola system is caught by a customised gutter built at the northern end. All drainage from the louvres and the roof is fed back into the existing water outlets below deck. 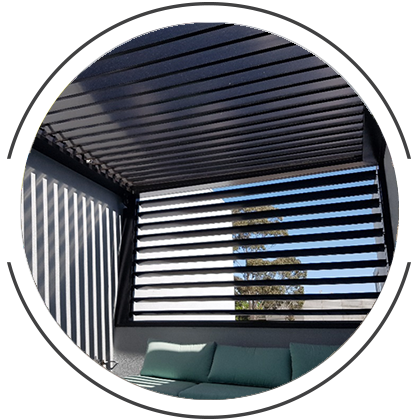 The finishing touches to this benchmark shade project were the exterior outdoor wire guide blinds to the Western side of the Louvre Roof Structure. The Westerly afternoon sun setting can be harsh in the warmer months and the appropriate shading was essential. We opted with a Wire Guide crank operated Outdoor Blind due to the angle that the blind had to run on . The fabric was a Visiontex Plus range to allow for sun and rain protection but giving patrons the ability to see through the blind. 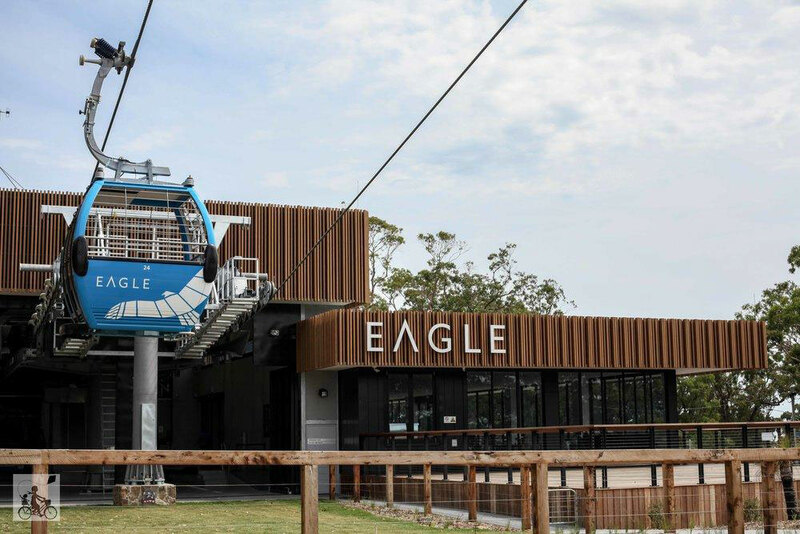 We were incredibly please with the end result of this project and we thank The Eagle Gondola for the opportunity to execute such a benchmark Shade Solution Project. We look forward to enjoying the new Alfresco area and look forward to working with these delightful clients again in the near future.